Solar Surface Water Pumping System is a Solar Photovoltaic (SPV) System, having an energy efficient DC Surface Centrifugal pump coupled with a 900W SPV Array. 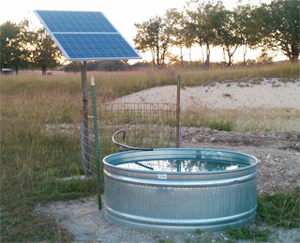 This system is typically used for providing potable water, crop irrigation and livestock watering. 2. Pump Type DC Sur. DC Sur. DC Sub. DC Sub.